This month I have TWO fabulous freebies to ensure that you are a REAL ‘Money Magnet’ this magnificent May! Get clear on your value How to ask for what you’re REALLY worth Understand your relationship with money and change your relationship with it Shift your imagination around what is truly possible Create a money magnet vision for the next 12 months Receive SUPPORT & RESOURCES & ACCOUNTABILITY to ensure your Success with Ease. Quite simply, you will leave the meeting feeling financially fired up! At our last money themed event in November, I was sharing the work of Ann Wilson, AKA ‘The Wealth Chef’. I have done several of Ann’s ‘Wealth Chef’ programmes and she has really opened my eyes to the financial possibilities of both destroying debt and getting money to work for YOU, rather than working for IT! So here’s the thing, she is offering to Damsels Directors her ’30 Days to Transform Your Wealth’ Programme – this is a Step-by-Step Guide for Mastering Your Money and Creating Wealth, she is offering it for FREE, and I can now pass this offer on to YOU. Understand how money works; Know the key ingredients of wealth, how to recognize them and what to do with them to create wealth heaven instead of money hell; Know what you really want and how to get it; Set up you wealth kitchen set up and create your wealth cooking tools; Define your money goals; Determine your wealth values; Create and embed a new set of wealthy money habits. Discover the 5 Recipes for Wealth; Know how to get Debt Free; Master your time and focus to create the wealthy life you really want. The next piece of Damsels news is that we are regularly holding ‘Licence to Lead’ days. These are content rich, game changing days for women who would like to explore becoming a Damsels Director and / or expand their entrepreneurial consciousness. To find out more, email juliew@damselsinsuccess.co.uk and tell her that Sandie Peachey sent you! 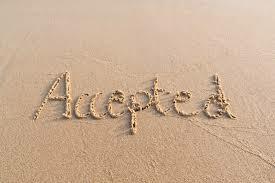 This acceptance is a prayer, an invocation, a whispered alternative to anger. It fills my head with positive movement and upward momentum instead. It is the opposite of negativity, it is synchronous and quiet; this acceptance moves me forward – instead of stalling and circling and sticking in my brain. It breaks the negative repetitiveness and consternation, and best of all, it is a simplistic swop. So… I accept this day; I accept the trees and the bluebells; I accept my life and what has led me to this point; I accept that I am here and now; I accept my situation; I accept my parents; I accept my decisions; I accept other’s reactions; I accept that things will change; I accept that soon this will all be unimportant; I accept the best; I accept the sunshine; I accept the opportunities to grow and to learn; I accept that I am skilled and amazing at many things; I accept that I am also a work in progress in others; I accept my work; I accept my companions; I accept the journey; I accept the blue sky; I accept myself; I accept the others.